I like the idea of I Don’t Care, because it leaves many options open for us, where we should work, live, and play. Karma’s year of I Don’t Care made me think that we may be in a Mid Life Crisis, but not the kind where you go out and buy fancy cars and such, but one where you must make new decisions about where to live, what work you want to do, and how you are going to spend your next 20 or so years. We want to simplify our life. We want to find a place to live where we can spend more time outside. We want to live in a place where you can go outside without freezing or burning; someplace where we can walk or ride our bike to many of the places we need go. We want to live in a place where people are open and friendly and chill. So the search begins. We have spent some time in Seattle, which is a beautiful city, and there are places in that city we could call home. Of course, the biggest plus for Seattle is that Dana and Greg live there :). We have also tried to spend more time in downtown St. Louis, exploring all that St. Louis has to offer, and we have discovered that it does have a lot to offer. If we decide to stay in St. Louis we will defiantly relocate closer to the city to a loft to try out urban living for awhile. Going back to California has always been a possibility for us, which is why we headed out west last weekend. One of the many reasons why Karma and I get along so well is that we both like to do “what’s fun” instead of what we should be doing (working, cleaning our house, getting ready for the big wedding, mowing our lawn, etc.). So the other day when Karma said we should go to Venice Beach for my birthday, to see if we still love the place, I did not do the rational thing and say, “That’s a great idea, but we have a wedding to pay for, you have a new semester to get ready for, and we need to spruce up our house before everyone descends on us for the wedding”, that would have been the rational thing to say, but instead I pulled out my computer, found a flight, booked a hotel room, and two days later we were on a beach watching the waves wash in. We spent the weekend in Venice looking around to see if California is still the place for us, we think it is, but we are still not sure. Are we worried? No, because it is the Year of I Don’t Care. Did you hear about the Jet Blue Flight Attendant who quit his job? Now he took the Year of I Don’t Care to an extreme. One of the passengers was acting inappropriately on the plane, and saying things that no one should say to another person, when the flight attendant said something to the effect that ‘I have been doing this for 28 years and I am done’. He then took two beers from the liquor kit, opened the front door (the plane was on the ground heading to the gate), deployed the emergency slide, slid down and out and went home. This flight attendant has become a hero for some and Jimmy Fallon wrote a song for him on Late Night with Jimmy Fallon – the song was appropriately called – “Take Two Beers and Jump” – which is going to be my motto for the year. When things are not going as they should, I am going to just take two beers and jump. Have any of you ever had a “take two beers and jump” situation or a mid life crisis of sorts? Did you ignore it or do something about it? This is my first installment of what I think of as our Mini Mid Life Crisis. I am not sure how many posts about this will follow, and I hope you enjoy the “process”, if not “take two beers and jump”. 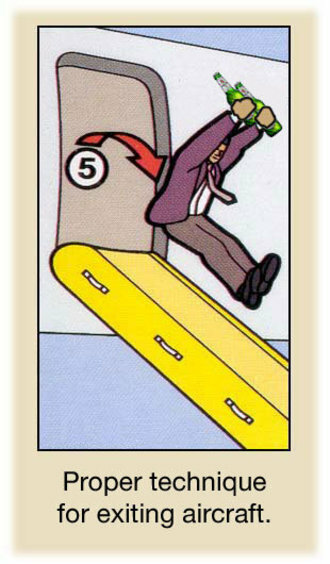 Tags: jet blue fight attendant, mid life crisis, take two beers and jump. Bookmark the permalink. Yikes, don’t get me started on this!!! I have had a few & ready for another! I want to get away from crazy southern CA & you want to come! 🙂 It is less busy in areas up north. The weather is nice though.. well, if the smog would go away!!! Like that I don’t care year! Your first line made me laugh :). I understand. I also am glad you reminded me of the smog. When we lived in Riverside, by 4 pm each day all of us (including Robbie who was young at the time) had headaches and we were popping Advils like they were going out of style. The beach has less smog, but we can’t hide out there every day – even though we would like to try. I loved your post today. I hope everyone will check it out: Learning From Experience. Yas CA can get busy, when we left in 1995, we were ready for a change, but we were in Riverside, big time smog and big time crime. Well off for a run and some boot camp. Nice post, Jimmy! My husband and I would love to be out biking and hiking more and have talked about the same issues you posted today…It has definitely been frustrating weather-wise these last couple years…record rain, heat, and then ice. Glad you are still planning on visiting Urban Wanderers…the exhibit is open Wednesdays-Sundays, and the last day of the show is August 29th. I noticed I am missing one gold star for a day I may have forgotten to report…no big deal…but August 10th I met with my trainer and did tons of push-ups! 🙂 Thanks!!! I hope you enjoy your day of relaxation. I can’t wait for the formal installation for the butterflies. What a beautiful project/event. I thought you had more stars! Thanks for telling me. All will be up and correct later today. I have Zumba on the brain now. I may try the Saturday at 12:30 class with Sara at the Crestwood Studio, but Sunday is a definite yes. I forgot to report on my workout today. Walked/ran (we ran a little farther today with some insane hillwork), boot camp, crunches, pushups, and squats. Today was a good day, could have been a great day if I was at the beach. Nice run with some boot camp, and plenty of work. Thanks to all of you who have left a comment on my post. Ever heard of California dreaming?? Things are hard to duplicate when you try going back. Although we loved it when you guys lived there. It’s hard to find the right place that you would love to live. Sometimes you just have to make your place in life where you are and change just a few things around you. You two make everyone happy no matter where you are. Hey CDale 🙂 I was hoping we would have an answer on your foot yesterday/today. I think you need some further work ups. I like you words of wisdom and I definitely think there is truth in everything you say. I think we will know more as the year progresses :). Choose the place in your heart that feels like home. That is what we did and we love it! We put up with crazy weather changes, cold when it should be hot and hot when it should be cold but all together Seattle is our home, so we put up with off weather years because in the end we know this is the place we love and wouldn’t want to be anywhere else! I just wish everyone lived by us : ) Jimmy I loved your post and I think we all get a bit of the I don’t care but you and Darla win the award this year( I wish we could all be just like you). You are so sweet, Dana. I know you understand what we are going through from your own experiences. Seattle is wonderful and if we could live with you, we would move there in a minute.